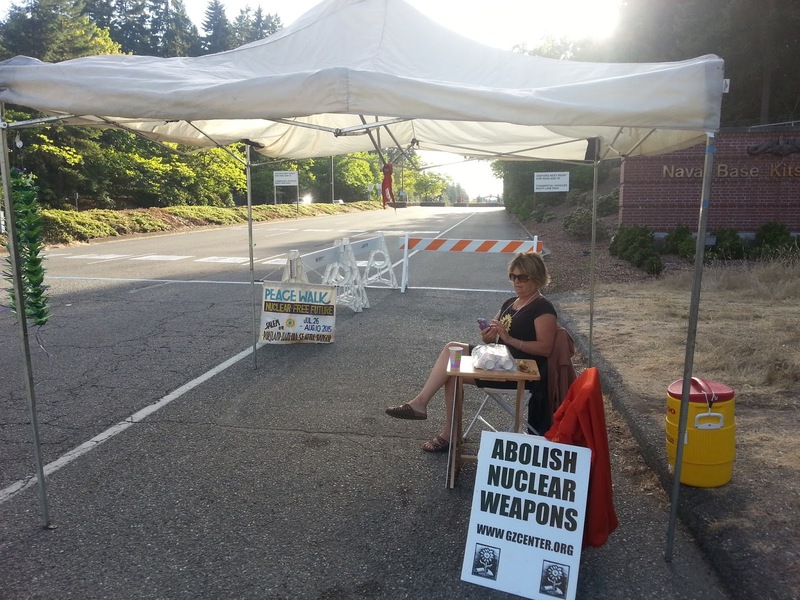 Fourteen peace activists risked arrest at a West Coast nuclear weapons base early Monday morning in a nonviolent protest against the continued deployment and modernization of the Trident nuclear weapons system. The Trident submarine base at Naval Base Kitsap-Bangor, just 20 miles from Seattle, Washington, contains the largest concentration of operational nuclear weapons in the US arsenal. Each of the 8 Trident submarines at Bangor carries as many as 24 Trident II(D-5) missiles, each loaded with up to 8 independently targetable thermonuclear warheads. Each warhead has an explosive yield up to 32 times the yield of the bomb that destroyed Hiroshima. The activists were among a larger group with Ground Zero Center for Nonviolent action holding a peaceful protest at the Naval Base Kitsap-Bangor Trigger Avenue entrance gate as employees entered the base for the Monday morning shift. The vigil commemorated the 70th anniversary of the atomic bombings of Hiroshima and Nagasaki. Seven protestors entered the roadway and blocked traffic entering the base. The banners read “We can all live without Trident” and “Abolish Nuclear Weapons.” The two incoming traffic lanes were blocked for approximately 48 minutes until Kitsap Sheriff's Deputies and Washington State Patrol officers arrived and removed the protestors from the roadway. Meanwhile, Navy personnel diverted incoming traffic around the banners via the outbound lanes. Cited for being in the roadway illegally were Mack Johnson, Silverdale, WA: Doug Milholland, Port Townsend, WA; Brenda McMillan, Port Townsend, WA; and Michael Siptroth, Belfair, WA. Eight others walked onto the base, blocking the roadway, and staged a die-in. While three activists dropped down on the roadway, the others poured ashes around them representing the ashes of those incinerated in the atomic bombings. Naval security personnel arrested them, cited them for trespassing, and released them a short time later. Two of those who entered the base attempted to deliver a letter to the commanding officer urging him to use every power availbable to him to call for an immediate halt to the updating and expansion of the Trident fleet under his command. The two were among those arrested. In the letter addressed to Captain Thomas Zwolfer, Commanding Officer, Naval Base Kitsap-Bangor, the activists said, "With the implementation of each and every step toward the refurbishing and upgrading of our nuclear arsenal, we continue to disregard prudence and morality; and with every deployment of a Trident submarine in international waters, we continue to violate international and humanitarian law that specifically prohibits the use and threat of use of any nuclear weapon (International Court of Justice decision, 1996). If we want to regain international respect we need to conform to what we expect of other nations: stop building and deploying these illegal and immoral weapons." Click here to read the full text of the letter. Arrested and charged by the Navy were Mary Gleysteen, Kingston, WA; Anne Hall, Lopez Island, WA; Ann Kittredge, Quilcene, WA; Betsy Lamb, Bend, OR; Peggy Love, East Wenatchee, WA; Emilie Marlinghaus, Bend, OR; Elizabeth Murray, Poulsbo, WA; and Michael Siptroth, Belfair, WA. The W-76 thermonuclear warhead deployed on the Trident II D-5 submarine launched ballistic missile has been undergoing a “Life Extension Program” in which the warheads are thoroughly refurbished and upgraded. The entire Trident fleet is slated for replacement, and the cost to build 12 OHIO Class Replacement submarines is estimated at approximately $100 billion (by the Congressional Budget Office). Leonard Eiger, coordinator for Ground Zero Center's NO To NEW TRIDENT campaign: “Trident has been deployed at near-Cold War levels since the fall of the Berlin Wall as a major symbol of global power projection. This, together with the continuing Trident modernization efforts, has led to the resurgence of Russia's ballistic missile submarine force. A new Cold War is developing that, in a completely different and less stable global context than the previous Cold War, poses a new and even greater threat of nuclear war. Trident is at the heart of this new Cold War and must be addressed now, before production begins on New Trident. It is critical that the U.S. and Russian leaders change postures and come together to begin the necessary dialogue to lead the way to a nuclear weapons free world. 70 years is long enough; future generations are counting on it. How would you spend 100 Billion? The US Navy plans to spend at least that much just to build twelve (12) new Trident ballistic missile submarines. If you think that money would be better off spent on human needs, tell us what you would spend it on. We will share the results with you. Click here to take our poll. Welcome to Ground Zero Center for Nonviolent Action's NO To NEW TRIDENT Campaign! For over 37 years Ground Zero has resisted the Trident nuclear weapons system, and now we are working to prevent another generation of Trident from threatening humanity with the threat of nuclear annihilation. We are working to stop production of the US Navy's next generation ballistic missile submarine. The SSBN(X), as it is called by the Navy, will cost nearly $100 billion just to build 12 submarines. Built to replace the existing Trident fleet, this new sub will continue to hold the world under the threat of massive nuclear war to nearly the end of this century. Click here and sign up to receive our newsletter, announcements and action alerts as we work to eliminate this wasteful and destabilizing nuclear weapon system project, and reallocate these funds for human needs. There is even more at our Facebook page! Welcome and Thanks to the campaign's newest Supporter, the Jane Addams Peace Association!!! We are grateful for JAPA's recognition and financial support. The Jane Addams Peace Association was founded in 1948 "to foster a better understanding between the people of the world toward the end that wars may be avoided and a more lasting peace enjoyed." Check out the latest news and opinion on Trident (and New Trident) below. Trident (and more) in the News! Nuclear Weapons Modernization: A Threat to the NPT? Thanks to artist and inventor R.R. Anderson for creating this poster for the NO To NEW TRIDENT campagin!!! I am a student and practitioner of nonviolence, working for the abolition of ALL nuclear weapons. I coordinate media & outreach for Ground Zero Center for Nonviolent Action (www.gzcenter.org), and also coordinate the Puget Sound Nuclear Weapon Free Zone (psnukefree.org) and the NO To NEW TRIDENT Campaign. Check out these related sites!